The latest media-generated debate exploded when Anne-Marie Slaughter revealed in the July 2012 edition of the Atlantic Magazine why she had left her fast-track, high-pressured job for Hilary Clinton at the State Department. Families, she admitted, could not withstand the strain. Even a superwoman like herself-- blessed with a helpful husband, enough wealth to buy domestic help and child care, could not do it all. Although she described the insane work policies that made her neglect her family, she implicitly blamed feminism for promising a false dream. It was too hard, the hours too long, the persistent sense of guilt too pervasive. What was missing in her article was the history of “having it all.” Too many editors care more about how an article about the death of feminism will, without fail, create a sensation and increase readership than about an inaccurate media trope. And her article went viral, as they say, setting off a round of attacks and rebuttals about the possibility of women enjoying - not just enduring - family and work. She returned to her former life as a high-powered professor at Princeton University, which in my experience, hardly counts as opting out of trying to have it all. To Slaughter, I want to say, you may know a great deal about foreign policy, but you certainly don’t know much about our history. By 1965, young American women activists in Students for a Democratic Society asked themselves what would happen to America’s children if women worked outside the home. The fact is, activists in the women’s movement knew women could never have it all, unless they were able to change the society in which they lived. 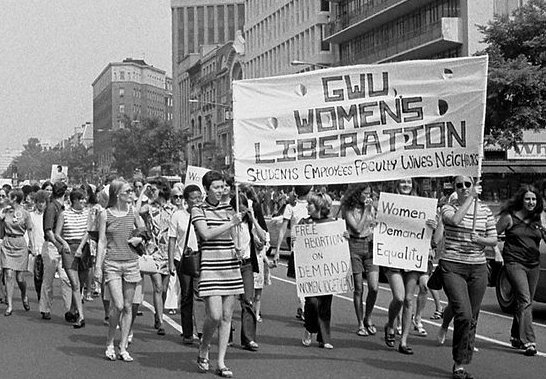 Women's liberation march, Washington D.C., 1970. At the August 1970 march for Women’s Strike for Equality, the three preconditions for emancipation included child care, legal abortion and equal pay. “There are no individual solutions,” feminists chanted in the late sixties. If feminism were to succeed as a radical vision, the movement had to advance the interests of all women. The belief that you could become a superwoman became a journalistic trope in the 1970s and has never vanished. By 1980, most women’s (self-help) magazines turned a feminist into a Superwoman, hair flying as she rushed around, attaché case in one arm, a baby in the other. The Superwomen could have it all, but only if she did it all. And that was exactly what feminists had not wanted. American social movements tend to move from a collectivistic vision to one that emphasizes the success of the individual. That is precisely what happened between 1970 and 1980. Alongside the original women’s movement grew another kind of feminism, one that was shaped by the media, consumerism and the therapeutic self-help movements that sprang up in that decade. Among the many books that began promising such fulfillment for women, was the best seller “Having It All” by Elizabeth Gurley Brown (1982) who tried to teach every woman how to achieve everything she wanted in life. Self -help magazines and lifestyle sections of newspapers also began to teach women how to have it all. Both turned a collectivistic vision of feminism into what I have elsewhere called Consumer Feminism and Therapeutic Feminism. Millions of women first heard of the movement when they read about the different clothes they needed to buy in order to look like a superwoman and the therapy they needed to become a confident and competent superwoman. Self-help books and magazines ignored the economic and social conditions women faced and instead emphasized the way in which each individual woman, if only she thought positively about herself, could achieve self-realization and emancipation. By 1980, the idea of improving all women’s lives—sisterhood—had been transformed into creating individual superwomen. Early activists—like myself-- bristled at the idea that feminism was about individual transformation. But no matter how many articles feminists wrote, they couldn’t compete with all the books and magazines that taught women how to become an assertive, well-dressed independent woman—as long as she had the wealth to hire domestic and child care to assist her ascent into men’s world.
" The all-around Supermom rises, dresses in her vivid pants suit, oversees breakfast and then searches for the sneakers and then goes off to her glamorous high-paying job at an advertisement agency where she seeks Personal Fulfillment and kids’ college tuition. She has, of course, previously found a Mary Poppins figure to take care of the kids after school. Mary Poppins takes care of them as if they were her own, works for a mere pittance and is utterly reliable. The feminist-- as remade by the media and popular culture-- emerged as a superwoman, who then turned into a scapegoat for a nation’s consumerism, the decline of families, and the country’s therapeutic culture. For this, the women’s movement’s was blamed, even though this selfish superwoman who neglected her family seemed bizarre, not to say repellent, to most of the early activists. The backlash again feminism, directed as it was against the women’s movement, reflected a moral revulsion against the shallow self-absorption of America’s consumer and therapeutic culture. And when Americans took a good hard look at this narcissistic superwoman who embraced the values of the dominant culture, they grew anxious and frightened. For they no longer saw loyal mothers and wives who would care for their communities, but a dangerous individual, unplugged from home and hearth, in other words, the female version of America’ ambitious but lonely organization man. Thus was born the cultural wars between stay-at-home moms and career women. Anne-Marie Slaughter’s article, like most women who have complained about how hard it is to “have it all,” focused on an elite group of female professionals who have the means to outsource parts of their job as mother, cook, cleaner and caretaker of the home. What she and others have failed to understand is that the original women’s movement sought an economic and social revolution that would create equality at home and at the workplace. Nor have most critics of feminism understood that the so-called “Mommy Wars” --battles fought between those who worked outside the home and those who were “stay-at-home” moms-- have also been fueled by the media. Missing from the media’s coverage of these Mommy Wars are the millions of working mothers who will never have it all, but still must do it all. Millions of women cannot afford to care for the children they have, work dead-end jobs, and cannot begin to imagine living the life of a superwoman. These are the women that the radical women’s liberation movement addressed and for whom they sought decent jobs, sustainable wages, and government training, social services and child care. These are the women who are stuck on the sticky floor, not held back by a glass ceiling.